Alexander County Television Network is a public information source for the citizens of the County of Alexander, North Carolina operated by Alexander County. The content provided on this channel is available to subscribers of Charter Communications Cable TV on Channel 192 and AT&T U-Verse Channel 99. The same content is also available via the Internet free of charge to local, national, and international users through the AlexanderCountyNC.TV web site. This channel provides up to date information regarding closings, services, and offerings by County Departments as well as complete coverage of all Board of County Commissioner meetings and other local board meetings. AlexanderCountyNC.TV is also a place to find up to date information during any emergency event effecting Alexander County. 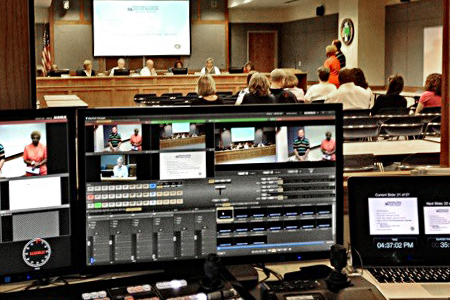 In addition to providing live content, visitors to the AlexanderCountyNC.tv site may also access the video on demand (VOD) section to watch previously aired content such as prior Board of County Commissioners Meetings and informational content. The search feature located to the left is great for finding past shows and meetings. Try to make searches as general as possible. If searching for a video on the library search for library. Instead of searching for Commissioners Meetings search for 'Commissioner', 'Meeting', or even 'Com'. Users can also use the Quick Tags below to quickly locate content. The daily broadcast schedule is also displayed on the left under “Today’s Schedule”.